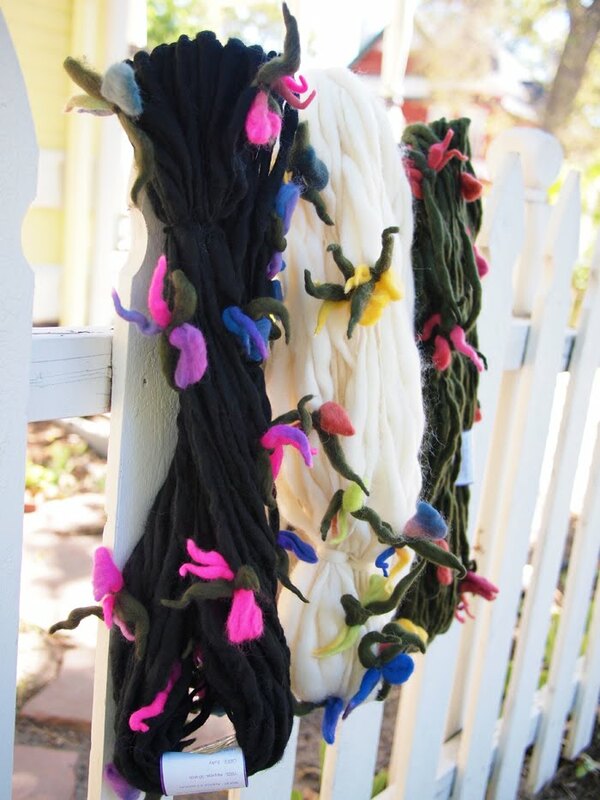 We just unpacked a box of wild and lovely "Handspun Bouquet" yarn from Pagewood Farms. This super bulky, thick and thin yarn is embellished with cute, wooly flowers. Keep warm as the weather turns cool with a colorful flower garden scarf. 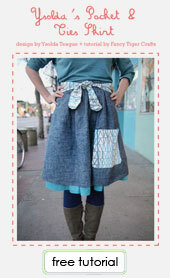 Just ask for this free pattern with your purchase! Jaime and I had so much fun in Iceland--it was seriously magical. Iceland is an amazing place. One of the things that made it so incredible was the lovely and inspiring knitters we met on our journey. We adored each and every one. Here are the folks that made Knitting in the Wild North so fantastic! Ragga is one of the ladies behind Knitting Iceland, the folks who organized the Knitting in the Wild North tour. 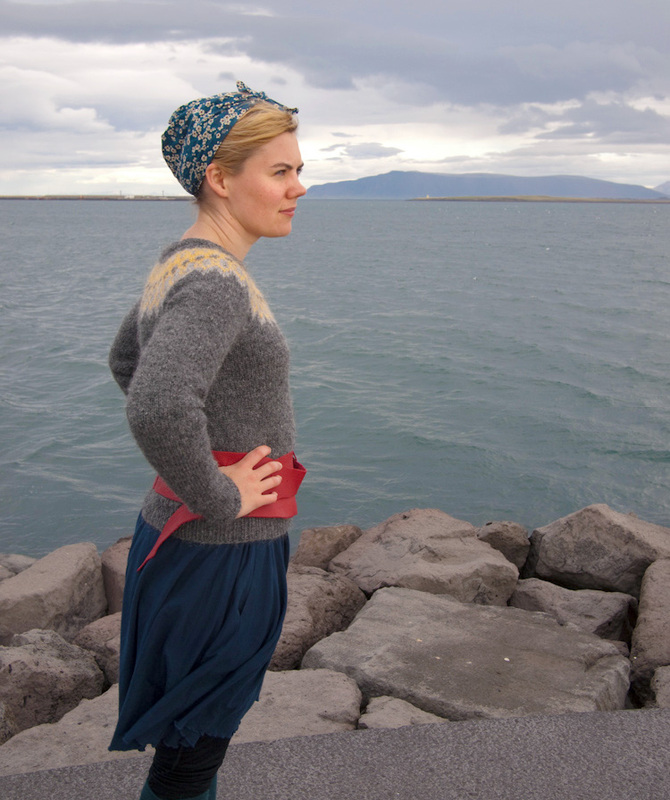 Ragga is a native Icelander, and has a great passion for the Lopi wool and Icelandic knitting tradition and it was catching. 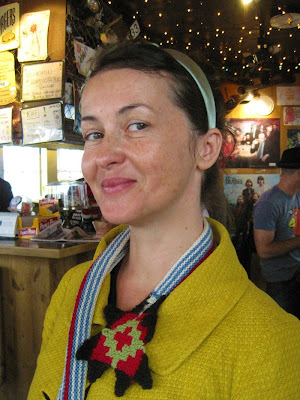 After taking Ragga's Lopi sweater class and seeing the many sweaters she was knitting while on our trip we were hooked. Thanks so much for sharing your passion! 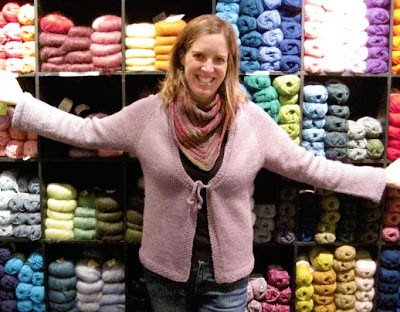 Hélène is another amazing lady behind Knitting Iceland. She totally impressed us with her amazing intarsia. Hélène showed us many samples from her book on Icelandic Color Knitting and we were blown away by the complex color work. It was great to learn intarsia from such an expert. 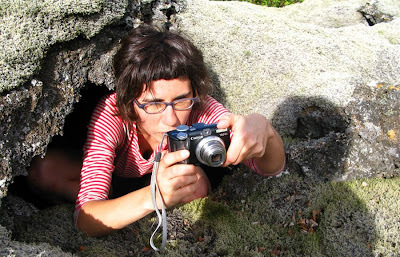 Hélène also was our hiking leader and showed us which mushrooms and lichens to pick and stowed away coffee, tea and chocolate in her backpack, for which we are grateful. Ysolda has been inspiring us with her amazing knitting patterns since back when we first fell in love with her Urchin hat pattern. 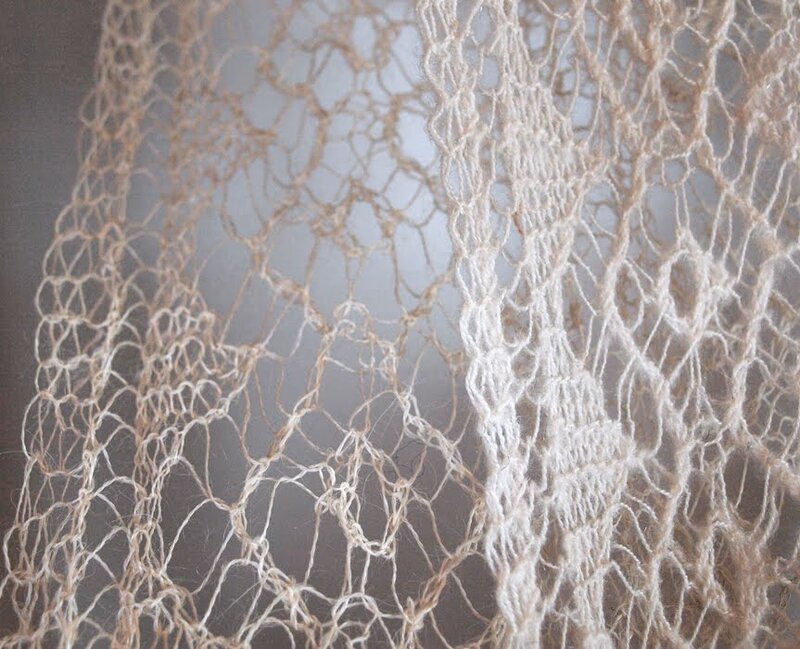 Since then we've knitted with fervor her plethora of beautiful patterns. Her Coraline, Damson, Emily and Ishbel are just a few of our favorites! It was great to meet Ysolda and get to know her. 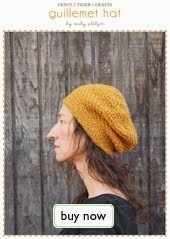 She blew us away with her ability to make up a pattern for a fitted sweater in a slip stitch pattern on the fly while riding on bumpy buses. It was so inspiring to take her shaping class and we are looking forward to her upcoming book on sweaters. We can't wait! What would we do without Ingibjörg? 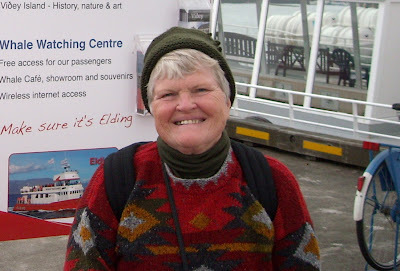 This fabulous viking lady was our chef, driver and tour guide extraordinaire--not to mention a fabulous knitter and naalbinder. 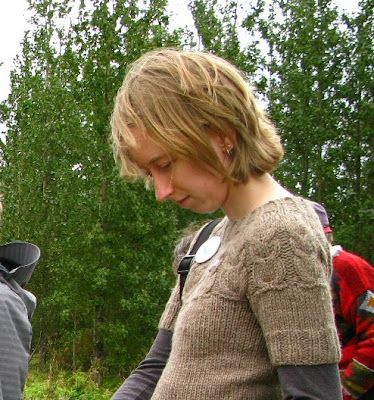 That's right, Ingibjörg is helping to keep the endangered viking craft of naalbinding alive. She amazed us with her many talents! Can you believe this sweater? And these mittens? And this shawl? And this hat!? Shannon impressed us with all of her handknits. 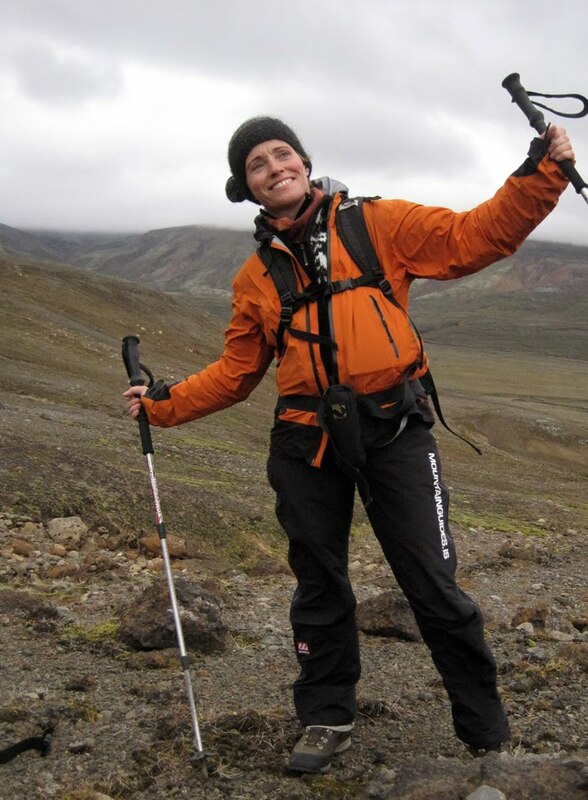 Shannon hails from Toronto and was very adventurous with her eating habits and willingness to try every Icelandic dish put in front of her. Mary Ann is from Portland, Oregon. She is seen here staying warm in the Icelandic highlands in her Ripley hat, another fantastic Ysolda pattern. When not knitting, Mary Ann can be seen wrangling sheep in the Icelandic countryside. 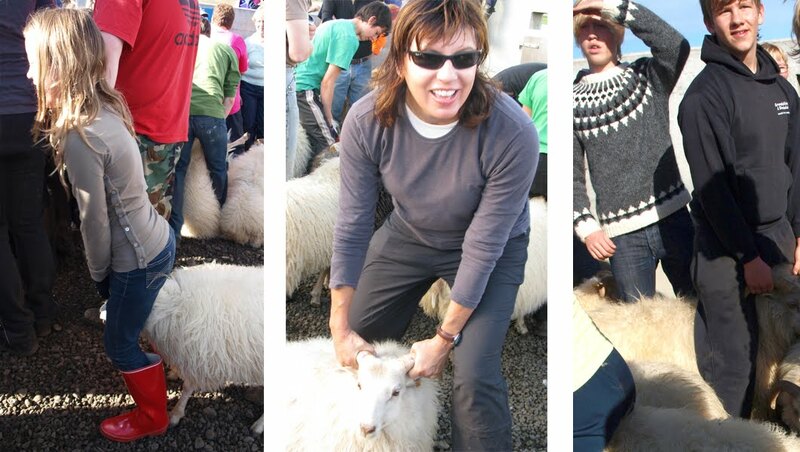 She was the best sheep wrangler of us all and showed us all how to get in there and wrastle a sheep! Diane is from Wisconsin. She is retired and spends a lot of her time knitting hats for the troops. She has knit something like three million hats to donate to the troops and luckily kept this one for herself (this may be an exaggeration, but she's knit a lot of them!). 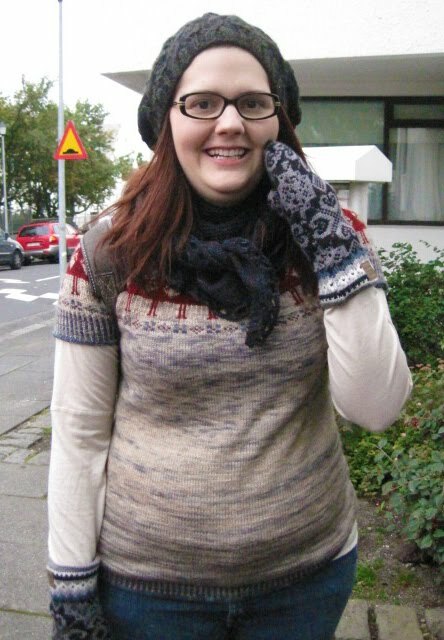 She also knit the awesome sweater she is wearing in this photo. 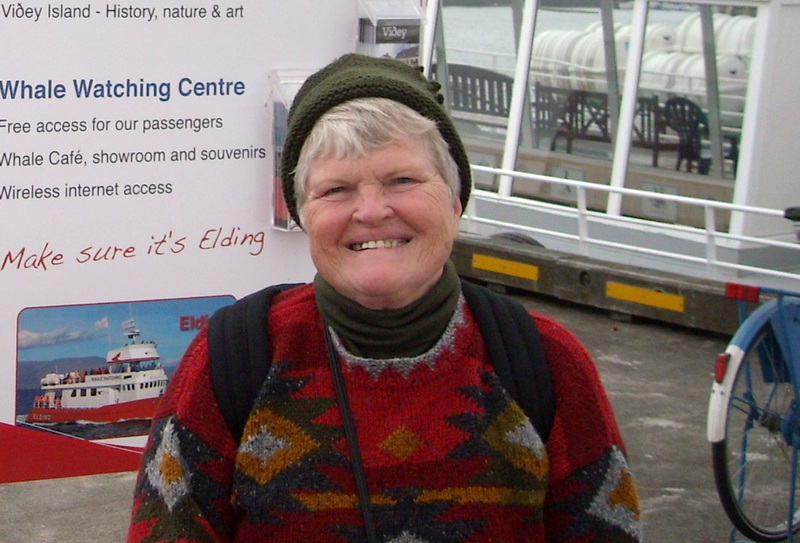 Thanks for inspiring us with your giving nature, Diane! 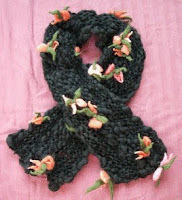 This is one of about 50 knit or crocheted items that Debi brought along. 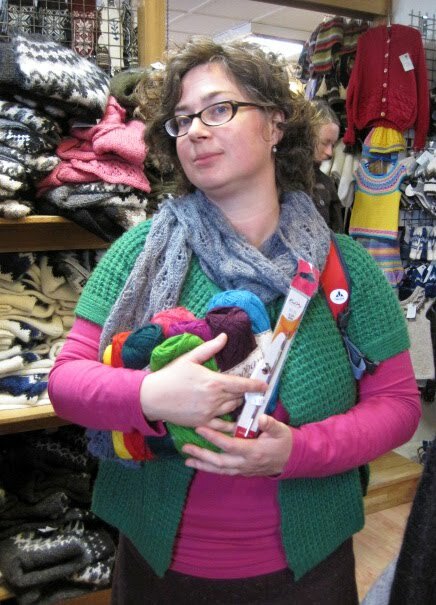 She has only been knitting since February, but you can tell she is on her way to knitting stardom with her prolific knitting. Debi was the first knitter we met on the plane to Iceland - we could pick her out because of the cute Owls sweater she was wearing. Debi, I wish I could finish half of the things you do! This is Cindy from the Netherlands showing off a small portion of the stash she acquired in Iceland. We loved Cindy's bubbly personality and adorable accent. 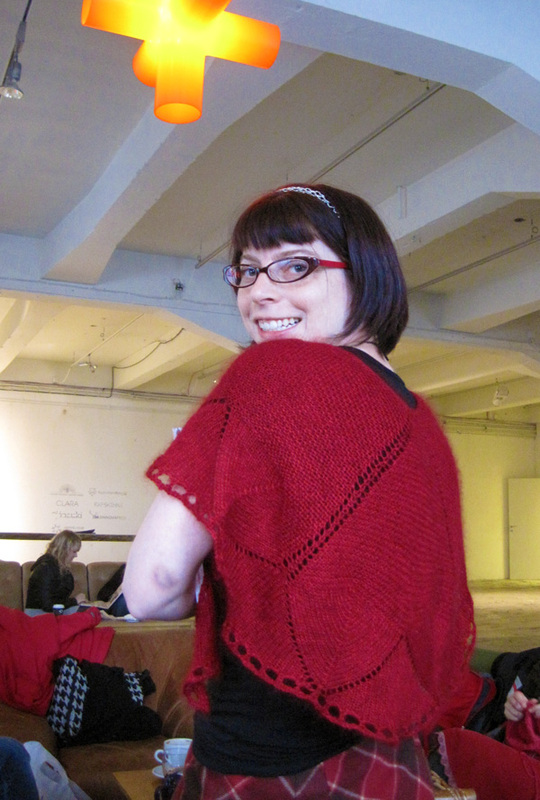 Here she is wearing a sampling of the gorgeous lace she knits. 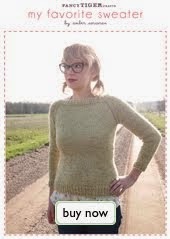 I wish we could meet her children which I imagine to be decked out in knits from head to toe! Amber is from Minnesota. Like everyone, Amber was sporting super-hot handknit garments everyday such as this owl sweater and another brown sweater knit on tiny needles that was gorgeous. What we loved best though, were her mittens. Adorable colorwork mittens with robots or koi made us want to knit some so bad! Catriona is from Canada--we now are under the impression that Canada is filled with nothing but amazing knitters who just wear handknit garments at all times. Here Catriona is showing off a stunning Koigu shawl and purple cardigan, photographed in her natural habitat surrounded by yarn. April, also from Canada, was so awesome because she could fit into elf holes and we believe she might secretly be an elf. She also had a sweet urchin hat knit out of a "Unicorn wool" so you know we loved it. It was so great to meet you, April! So these are all the amazing ladies we were fortunate enough to travel through Iceland with. We were inspired daily by them and it just makes us so proud to be a part of the worldwide knitting community. This concludes our reports on Iceland, I hope you all enjoyed it as much as we did! Leaving the wild north of Iceland and Blönduós behind us we headed south towards Reykjavik and the Agricultural College in Hvanneyri. 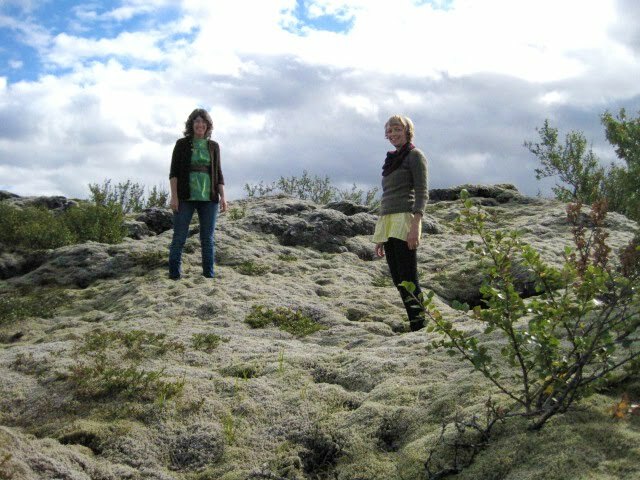 On the way we stopped for a magical lunch on a moss covered lava field. The lava rocks were covered in layer upon layer of moss making it super thick and squishy. Upon closer inspection of the mossy field we discovered that it was actually an elf city! 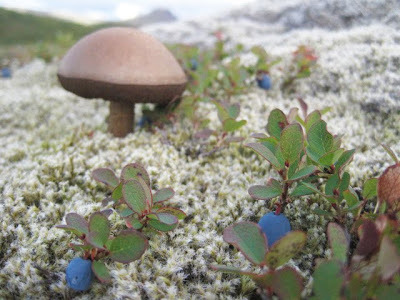 There were elf homes everywhere and carefully cultivated mushrooms and blueberries growing in the moss. We helped ourselves to some tasty blueberries and tried to go into the elf homes but we were just too big. Somehow April and Ysolda both managed to find their way into one and we now suspect they are really elves. 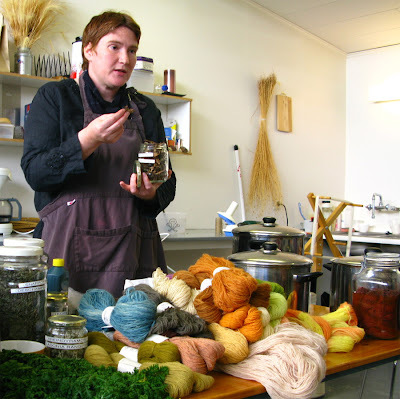 At Hvanneryri, we sat down to a class on dyeing wool using the native plants of Iceland. 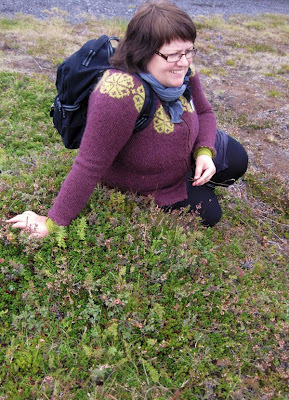 Our instructor was botanist Guðrún Bjarnadóttir who dyes yarn under the name Hespa. 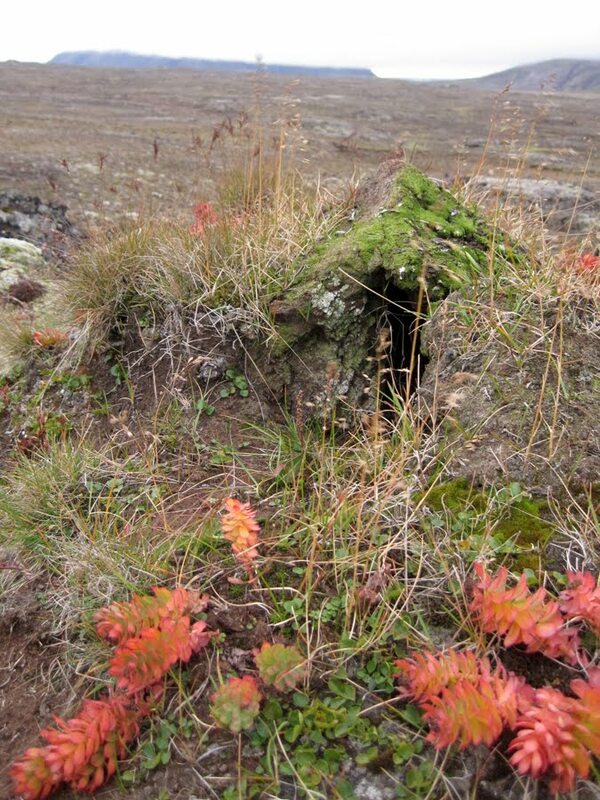 Guðrún showed us all types of plants she uses including mosses, lichens, lupine, birch, meadowsweet and rhubarb. 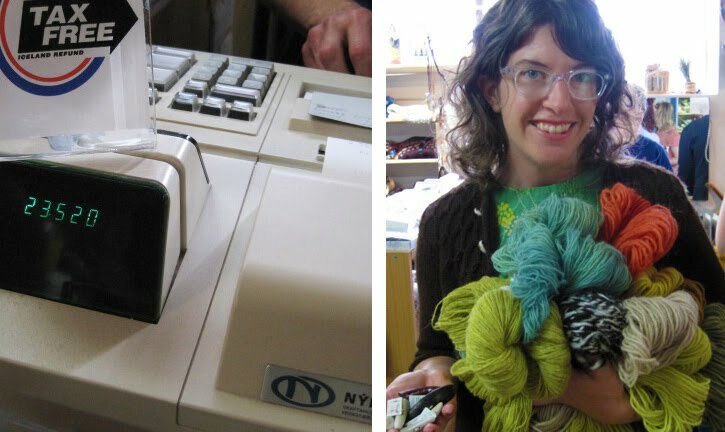 She has all sorts of techniques to bring out the most vibrant colors including one method of soaking the wool in a dye bath of cow urine for up to 2 months! Mmm... Guðrún's yarns were amazing and she had a few different dye baths going for us to experiment with. We were also able to get our hands on some Icelandic fleece at Hvanneryri at a spinning workshop. First we learned how to separate the thel from the tog which involves pulling the longer tog hairs while holding onto the shorter thel hairs by hand or using handcarders. Then we carded the raw fleece by hand and spun it. Amber and I each spun up all of the natural colors of fleece and plied them together to make super-cute barber-pole yarns of Icelandic wool! Our hands were super soft after spinning the raw fibers up with all of their lanolin-y goodness. Check back tomorrow and we will introduce you to all of the amazing and inspiring crafters we met on our journey through Iceland! 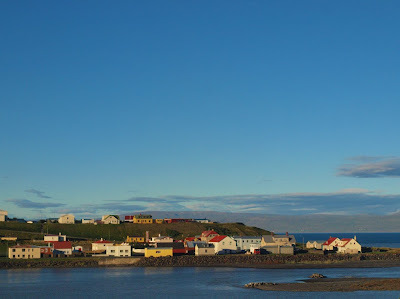 The next part of our Knitting Iceland tour brought us to the picturesque seaside town of Blönduós. Blönduós boasts a population of 1000, spectacular salmon fishing, and one of the most amazing textile museums of all time! We were lucky enough to stay at an old women's college that is right next door to the textile museum and right on the water. The rooms were decorated with wallpaper, photos of past graduates, and antique sewing machines! The textile museum at Blönduós houses the amazing collection of Halldóra Bjarnadóttir who had an affinity for weaving, knit items, traditional costumes and all sorts of woolen treasures. We were lucky enough to have the museum opened just for us (it usually closes September 1st for the winter) and we were allowed to don white gloves and handle the collection. 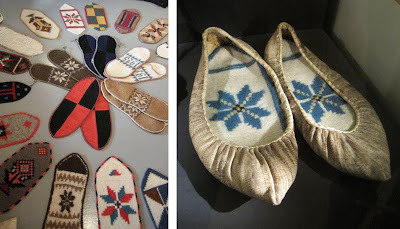 One unique part of Iceland's knitting tradition is their woolen shoe inserts. These inserts were knit with amazing garter stitch intarsia. It is very rare to see intarsia done in garter stitch, but it was probably used because garter stitch produces a fuller fabric that would have been warmer in Iceland's harsh climate. 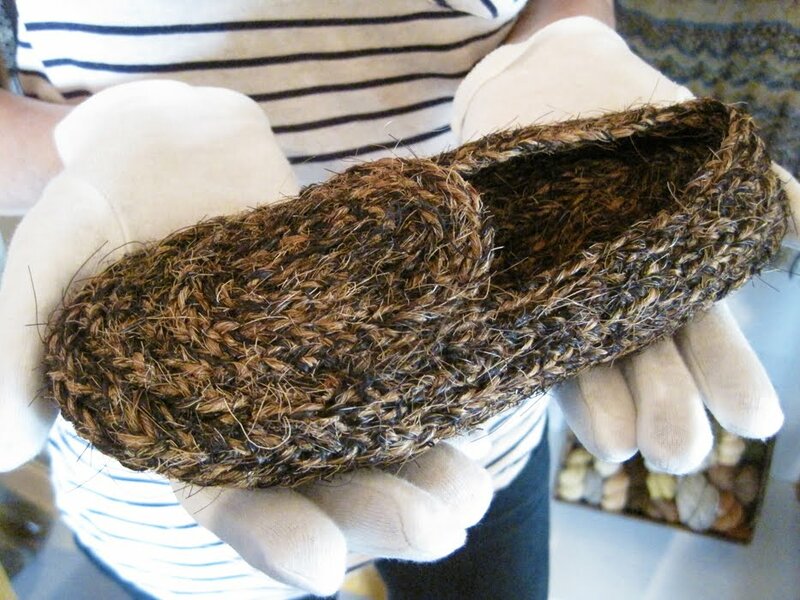 The inserts were put into traditional fish skin shoes and would wear out quickly when walking across the sharp lava fields, so they were a wardrobe staple that was knit often. They were very colorful - the perfect way for a knitter to use up scraps of bright yarn! The textile museum has an impressive collection of these inserts and it was inspiring to see all of the colorful patterns. There were so many mittens! There were knit mittens, embroidered mittens, mittens made from naturally dyed yarn, and photos of naalbinded mittens. If you need ideas for knitting mittens, may we suggest a trip to the textile museum of Blönduós? Amber and I found the most amazing artifact of all time in the textile museum - these shoes that were naalbinded with horsehair. We're not sure who would have worn these shoes which were perhaps the pokiest, prickliest shoes we've ever touched. It would take a real Viking man or woman to wear these shoes! 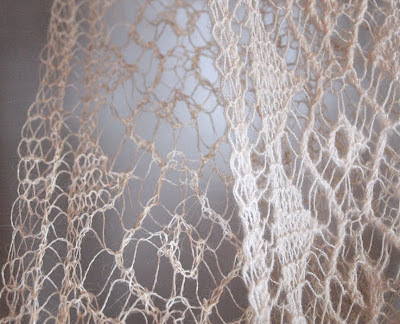 There were many examples of knitted lace. 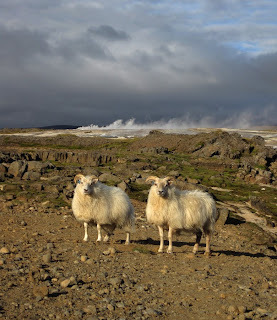 Our favorite were these two shawls which showed the difference between knitting with the thel versus the tog of the Icelandic sheep. Icelandic sheep are unique in that they are dual coated. 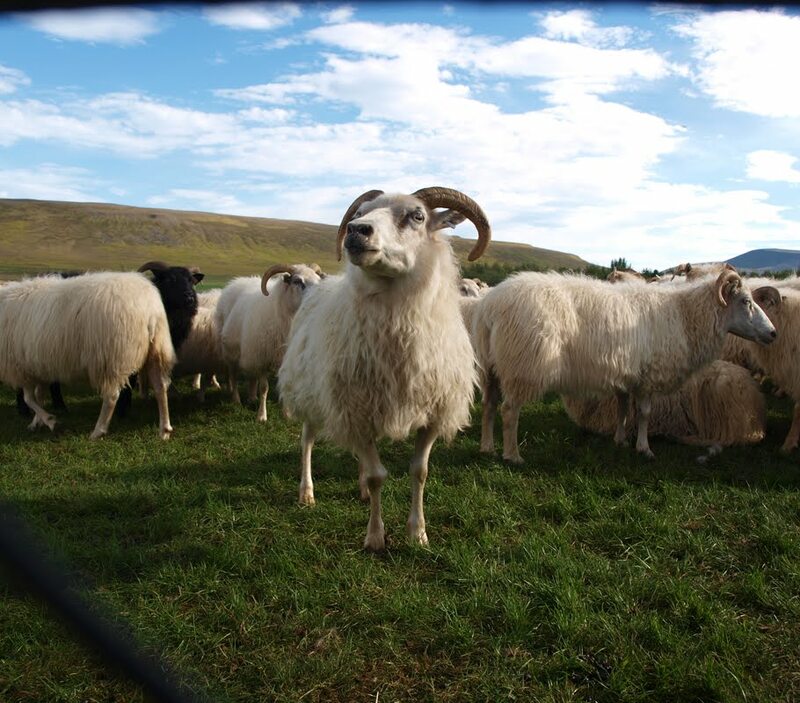 The outer layer of wool is called the tog and consists of coarse, long hairs that are durable and waterproof. The undercoat is the thel and is soft and fine. The shawl in the foreground on the right is knit with just the soft thel and is very light and airy. The shawl in the background toward the left is knit with just the tog and is stiffer and holds the shape of the lace very well. Lopi yarn uses both the thel and tog together and that is what makes it so warm and lofty while also being sturdy and durable. After our visit to the textile museum (and the super-fun Blönduós swimming pools) we sat down for a class on intarsia knitting with Hélène Magnússon. 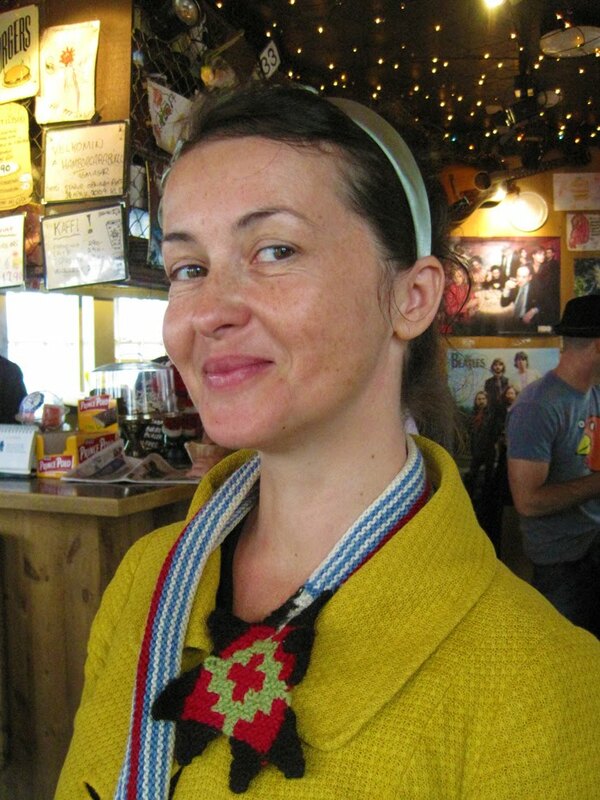 Hélène is one of the founders of Knitting Iceland and is also the author of the book, "Icelandic Color Knitting" which features modern intarsia patterns inspired by the patterns found in the traditional Icelandic shoe inserts. 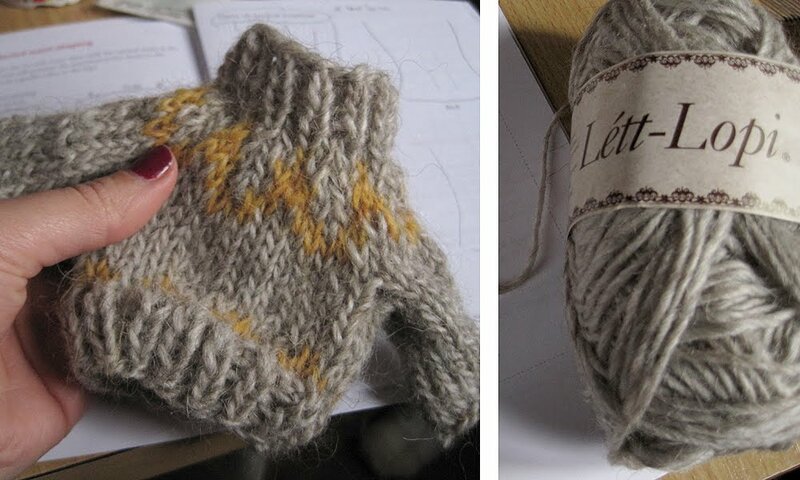 Hélène taught us how to do garter stitch intarsia while making a tiny shoe insert. Intarisa is challenging, but super exciting once you get the hang of it. Hélène also showed us how to do Slynging (pronounced slinking) an old and traditional type of weaving that was often used on the edges of the shoe inserts (a future Lost Crafts Series class perhaps?). Ragga and Hélène had a super awesome surprise for us on our journey from Hveravellir to Blönduós: a stop in the rolling countryside of Auðkúla for sheep sorting, or réttir day! There are no large predatory animals in Iceland, so every spring Icelandic sheep are let loose in order to graze all over the countryside. 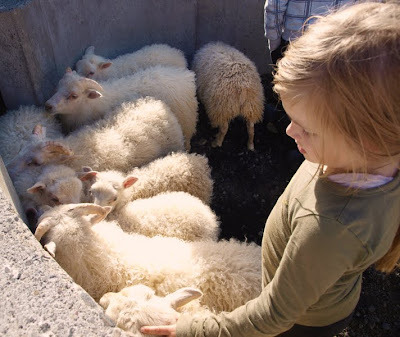 In the fall, the sheep must be brought in so they can spend the harsh winters in the shelter of their respective farm. 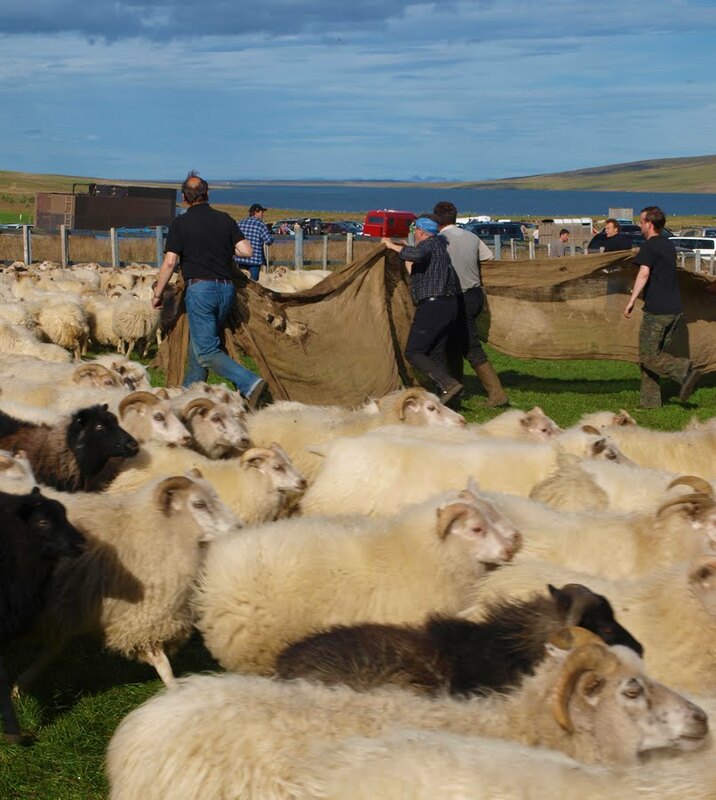 As you might imagine, the sheep get very mixed up out in the wild so it is quite a task sorting them all out - here's how it happens. 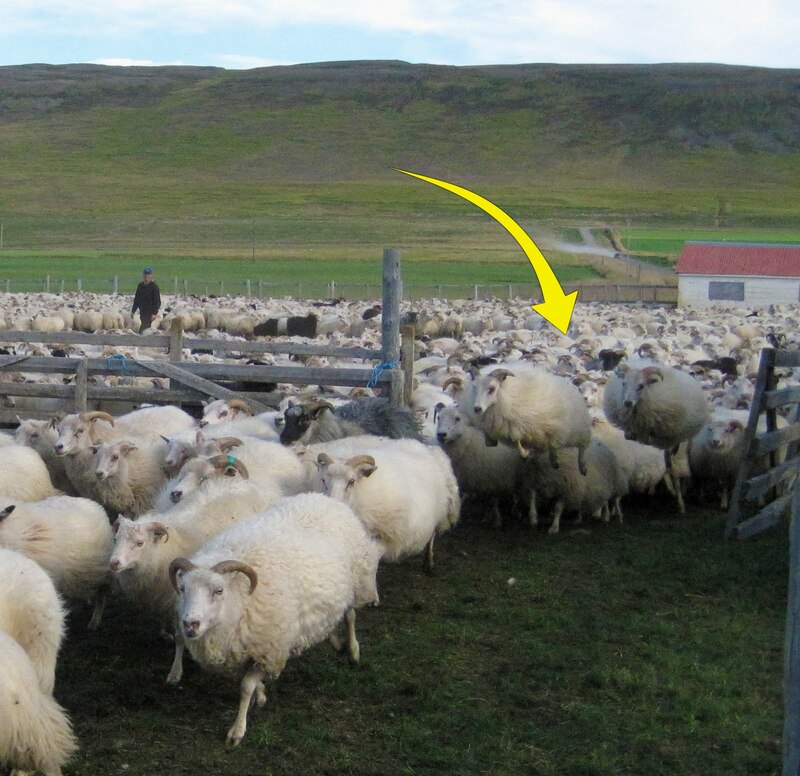 First, all of the sheep are rounded up and brought into to Auðkúlurétt by people on foot, on horseback, and on ATVs - this is called göngur. Once all the sheep have been gathered, everyone in the surrounding areas arrives to help the farmers for réttir. The sheep are separated out into more manageable batches of about 100 and herded into a central corral where everyone is waiting to sort them. Coming off of this corral are about 20 long pens - each one is marked with a code above its gate that designates a farm. This central corral is where all the magic happens. Everyone grabs a sheep by the horns. Once you have a sheep you will want to throw your leg over it and straddle it for better control as they are wily! Next you try to get a look at the tag on your sheep's ear which will have a code printed on it - this designates which farm the sheep belongs to and will correspond with the code above one of the pens attached to the main corral. You find the correct pen and steer or drag or carry your sheep (depending on how cooperative it is) to the right pen and put it in the pen through the gate. Yay! You've just sorted one sheep. Now grab another one and do it again and again and again. Once all the sheep in the corral have been sorted, its time to go back into the main field and separate out another 100 sheep to sort and the whole process starts again. 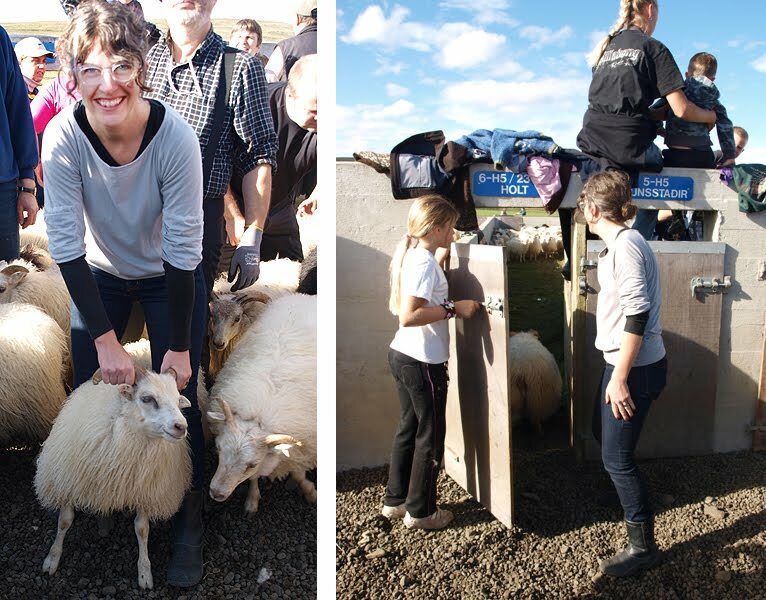 Everyone can help out on sheep sorting day. It is hard work and takes hours to get all the sheep in the right place. 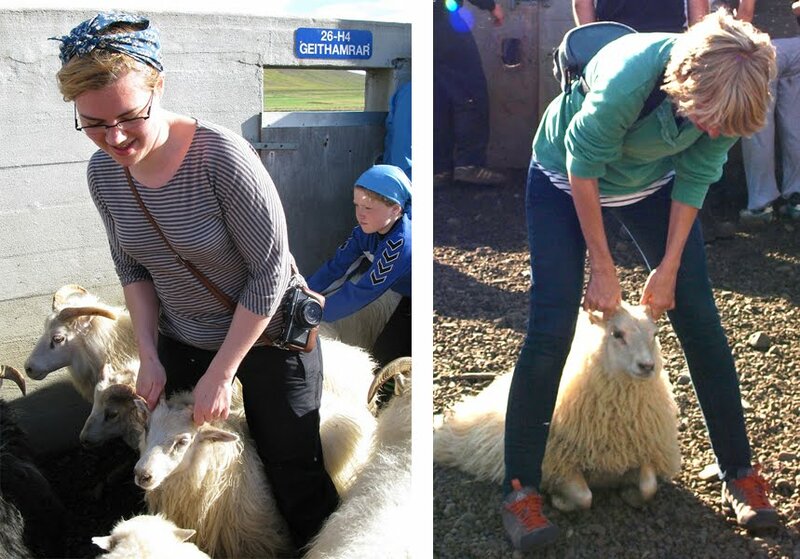 All of us were able to lend a hand sorting the sheep and the Icelanders were surprised to see tourists not afraid to get their hands dirty wrangling sheep. 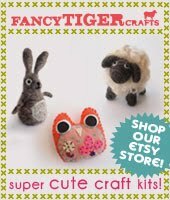 Of course, we could hardly wait to get our hands on those woolly, fluffy cuties! 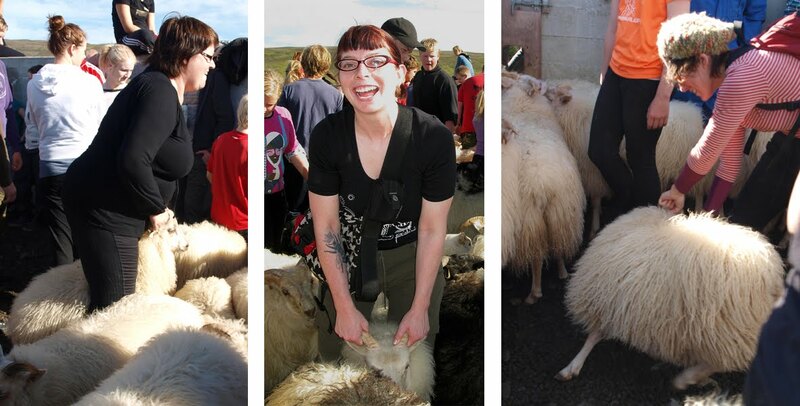 From top left moving clockwise, here are some of the sheep wranglers: Ragga, Debi, April, Amber, cute Icelandic boys, Mary Ann, cute Icelandic girl, and Ysolda. Nice work everyone! Some of the sheep were born after they were turned out to pasture in the spring and therefore do not have tags. These lambs are collected into a pen in the middle of the corral for sorting later. They are not opposed to cuddling. Once all the sheep from the main pen have been sorted, its not over - there are thousands more sheep in other pens waiting for their turn. The new batch of sheep are herded into the main pen. 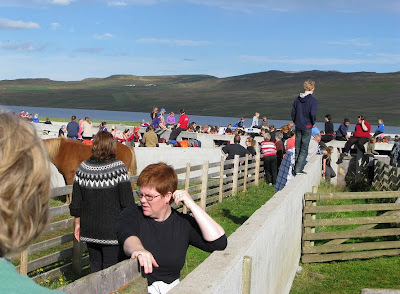 It was awesome to watch so many thousands of sheep running and jumping into the main pen. Those sheep can really jump high! Well, it looks like there are a few thousand more sheep to sort, but we must head to Blönduós. Good luck Auðkúlurétt! 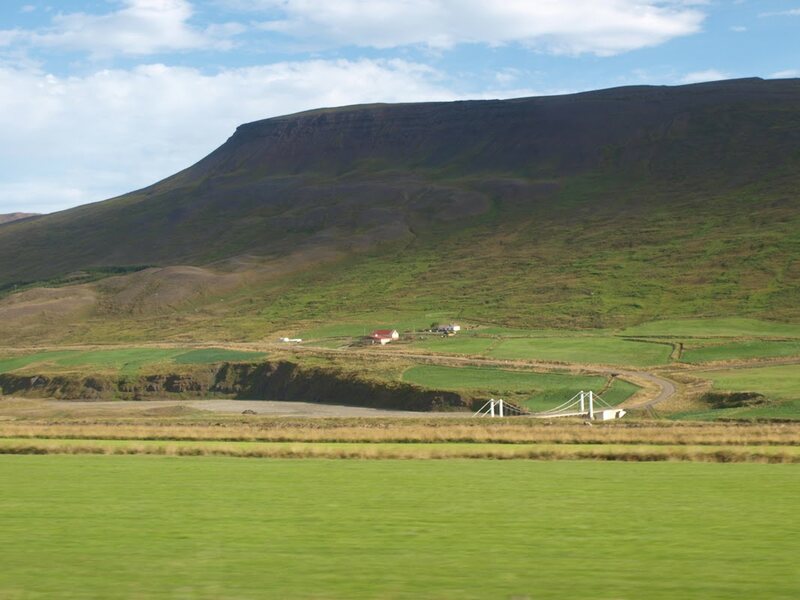 After leaving Reykjavik we traveled up towards the middle of Iceland, into the stark landscape of the highlands. 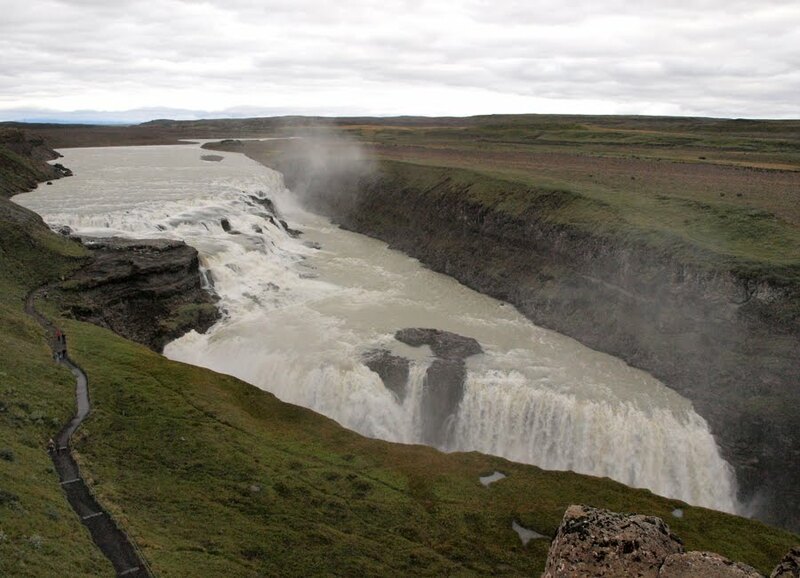 We stopped on our way to see some of Iceland's natural wonders, including Þingvellir, Geysir and the waterfall Gullfoss. Iceland is filled with stunning places and it was one breathtaking view after the next. 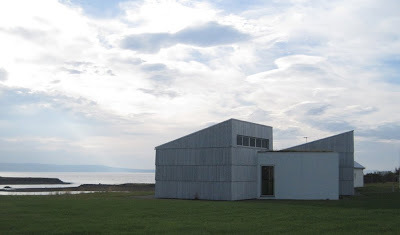 We finally arrived at our home for three days at Hveravellir. Hveravellir is located in the north central highlands of Iceland in between the two glaciers Langjökull and Hofsjökull. In the middle of the desolate landscape this thermally active area is an arctic oasis. 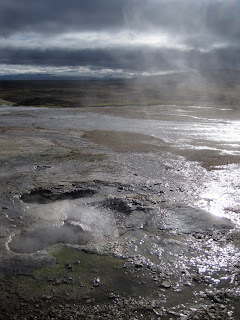 It is covered with steaming creeks and chasms filled with boiling water. While at Hvelavellir we stayed at an adorable cabin. We split our days between knitting workshops, hiking and relaxing in the nearby geo-thermal pool. When we woke up after our first nights stay we were excited to see our cabin had been surrounded by sheep overnight! Amber and I put on our jackets and spent the chilly morning on a sheep photo shoot - the best way to start the day! We went on two epic hikes while staying in Hveravellir and saw all sorts of amazing things including this traditional turf house, a hidden cave, an ancient volcano field and magical elf houses. Hélène, one of the Knitting Iceland co-founders, showed us how to harvest lichen that we later made into a traditional hot drink that is a traditional cold remedy and great for your immune system. 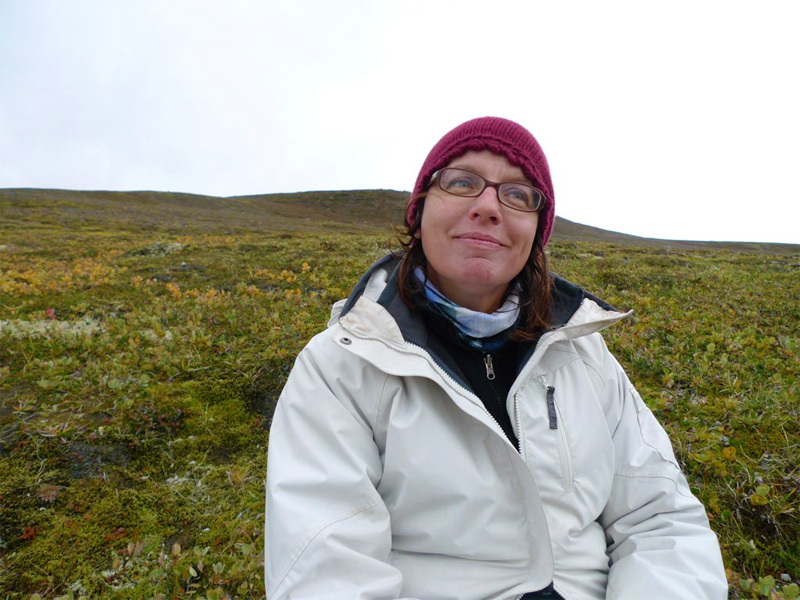 Hélène also introduced us to the importance of taking a break during a hike for coffee, tea, cookies and chocolate! This is the magical elf house we found on top of a "lava muffin" in the Valley of the Thieves. 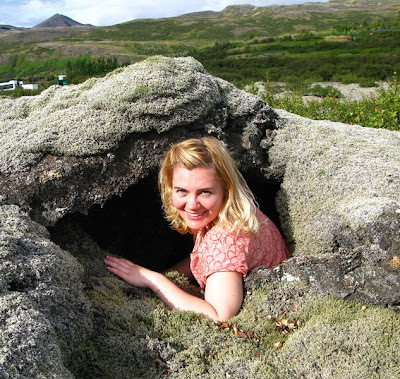 In the middle of a seemingly vast and desolate lava rock-covered land was this grassy elf hole. The entrance was covered with beautiful and mysterious flowers - the work of elves for sure! When we weren't hiking we were knitting! First we had a Lopi sweater class with Knitting Iceland co-founder Ragga Eiriksdottir. Ragga had us knit her pattern for "the Little Lopapeysa" - a miniature Lopi sweater. 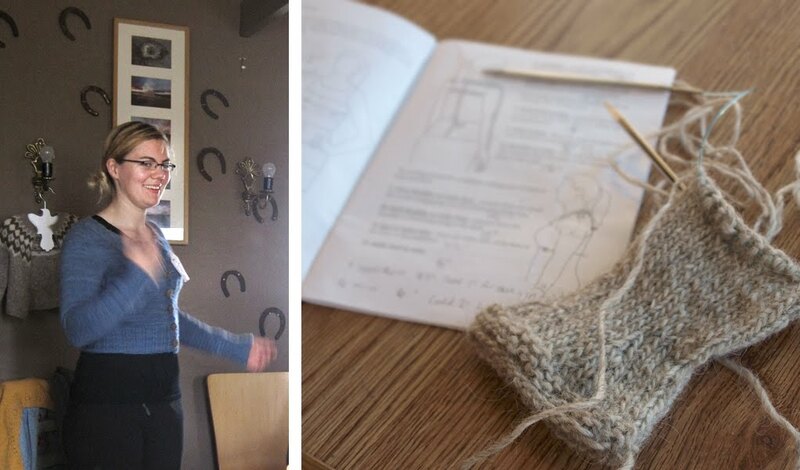 We learned all of the aspects of knitting a bottom-up traditional yoke sweater in three hours. Ragga showed us the awesome and stretchy German twisted cast-on and I got to do my first ever stranded color work (crazy that I haven't done color work before, I know). The finished product is so adorable and we feel ready and confident to embark on our human-sized Lopi sweaters. Ysolda Teague then taught us an in-depth class on shaping. We started with taking measurements, lots and lots of measurements. Then we practiced our shaping skills by knitting a tiny hourglass sweater. We did darted waist shaping and learned about how short row bust darts can make all the difference in fitting a sweater. Ysolda helped us with handy calculations so our Lopi sweaters can be perfectly shaped according to our gauge and our measurements. We learned so much and had so many amazing experiences in Hveravellir. Next up - sheep sorting in Auðkúla! New! 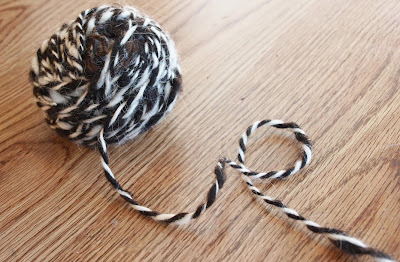 Imperial Stock Ranch Yarn and Roving!